Am 76 and it’s time to let go of my car collection. 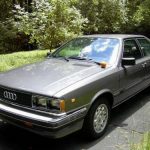 I bought this Audi from a commercial pilot who bought it new in Atlanta Georgia on 11-26-82 so I am the 2nd owner. It has remained in Georgia it’s entire life and was driven until 2000 when it was put into storage. It has not been driven for 18 years. The odometer stopped working at 42165 miles (indicated) and the original owner says that the correct mileage is about 60,000. We recently took it out of storage and serviced the car to get it back on the road. Not even a hint of any kind of rust anywhere. I have the original clear Georgia title from the first owner. The car has power steering, power brakes, air conditioning and a sunroof. 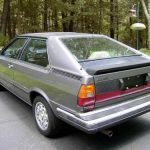 VALUE: As of this writing Hagertys classic car values the 1982 Audi at $2,600 fair, $4,700 average, $7,800 excellent and $12,200 concours. It is also a good investment as the value will more than likely increase over time, as these cars have already hit the low point in value and are on their way up. This is an above average car. Excellent stock original compartment – very clean and tidy. New timing belt and other belts and a new battery. Cooling fans work well. Very straight damage and rust free original panels throughout. The sunroof works. The top of the car has some areas where the clear coat has turned a light foggy color – You can see it in a few photos. The rest of the paint on the car is excellent. Everything is original and in good condition. Bumpers, bumper guards, bumper brackets, tail lights, grille, headlight assemblys – all original and nice. The interior is all original leather. The drivers seat has seen use – rarely did he have any passengers. The leather has hardened moderately in areas over the years but is still in good serviceable condition. The door panels are still the nice original leather. All original suspension and braking mechanisms are working well. 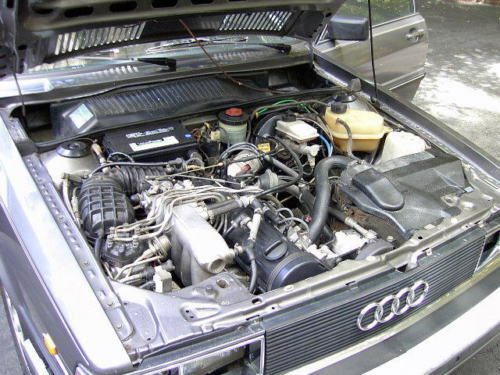 Car needs to be driven on the road to get some exercise – It has not been on the road for 18 years. PAYMENT & BIDDING: Contact me if you have less than 5 feedbacks or your bid WILL be cancelled. A $1000 non refundable deposit via Paypal is due immediately after the auction closes. The balance is due within 5 days via priority or overnight mail with a bank cashiers check or cash. No Paypal for the balance. Payment is to be made IN ADVANCE of collecting the car. IN ADVANCE, BEFORE YOU COLLECT THE CAR – This is an auction and you have plenty of time to inspect the car personally or have a 3rd party inspect the car – inspections are welcome and encouraged. Full payment is due BEFORE the car is collected. 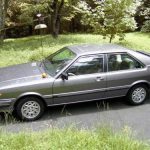 Winning the auction does not mean that you now have the privilege of coming to inspect the car to see if you like it – if that is your intention, please do not bid on the car. 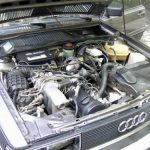 If you cannot trust me, my reputation, the description and the extensive photos then it is your responsibility to inspect the car yourself or have a third party inspect it for you. When the auction is over payment is due at the close of the auction per these instructions. I have sold approximately 25 cars and motorcycles on ebay and they all have been a bargain. This one certainly is. No Paypal for the balance. If the car has not reached what I consider to be a fair price the auction will be cancelled before the 12 hour end mark. I like this Coupe a lot, and most of that comes down not to the configuration but to the presentation. Sure, the photos aren’t as slick as some of the shots from the Canadian example, but overall this car presents very well and is even more original. The car was remarkably preserved, and while it shows signs of its nearly 40 years on Earth it’s hard to fault it. In fact, some of the patina and the story behind its ownership might be even more endearing in today’s market than a lightly restored candidate. The car retains a shocking amount of originality; the bellwether on these cars is for me the side radiator cardboard, and yup – it’s still in place. 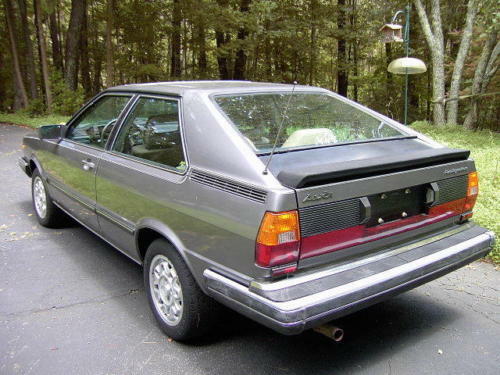 The color appears to be Stone Grey Metallic and though the pictures aren’t close up it looks in good shape. The leather striped interior also shows well overall and is a treat to see. Original ‘Cookie Cutter’ alloys feature the correct silver caps I mentioned in the last post. And, thankfully for posterity but not for your ears, the original radio is here this time. With two days to go, bidding sits below $3,000. Seriously, what more could you get for this price? Although ‘survivor’ is oft claimed recently, this car really personifies it. As a result I’d not be concerned with the TMU or the light mechanical refresh this car will need after prolonged storage. Condition is king, and long live the King. 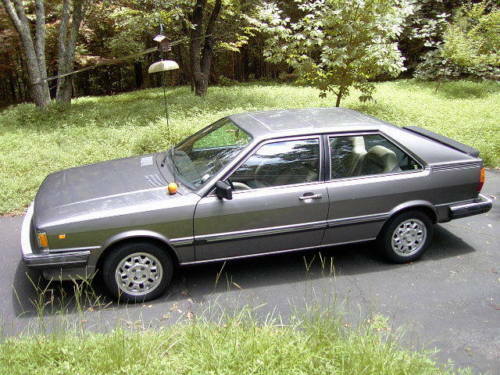 Tagged 1982, Audi, B2, Cookie Cutter, Coupe, inline-5, Stone Grey Metallic, Typ85 Type 85, WE. Can’t quite make out all the deets on the interior, but a leather set up plus unmarked dash and factory mats would be nearly worth the current bid for a needy UrQ owner. I believe these wheels were available in both 13″ and 14″ variations. 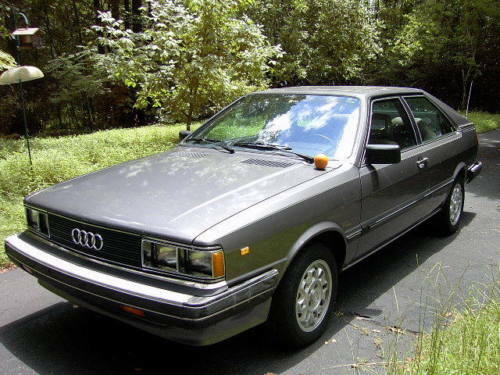 Assuming that is true, did the coupes always come with the 14″ ones?